For lots of us canning season is at its height about now. Everyone’s putting up luscious fruits and tasty veggies to enjoy throughout the year. One of our favorites and the recipe I do most every year is kosher dill pickles. I’ve only done a few quarts so far this year and really should get busy doing some more. I’ve done a few bread and butter pickles but no jams or preserves yet. Need to get those done while peaches are still at their peak. Can you tell that canning is something I really enjoy? But what if you don’t have all the canning equipment or just don’t enjoy doing all that work? Well then, maybe refrigerator pickles would be more your style. These refrigerator kosher dill pickles are a copycat of those you find in the refrigerator section at your grocery store. I’m sure you know the brand :-) They’re really, really easy to do and have a great flavor. I’d love for you to give these a try and let me know how you like them! If you happen to have fresh dill in your garden, you can use the heads in this recipe. Otherwise, dried dill seed works just as well. If you use the fresh dill, pack in the jars with the cucumbers. If using dill seed, put them in with the vinegar solution. In a large saucepan, bring the water, vinegar, onion, garlic, mustard seed, canning salt and dill seed (if using) to a rapid boil. Cook until the salt has completely dissolved. Set the mixture aside and allow it to cool to room temperature. Prepare six wide-mouth quart canning jars and lids. Wash the jars, lids, and rings thoroughly in hot, soapy water. Rinse well. Keep the lids warm in barely simmering water until ready to fill the jars. To sterilize the jars, place the jars in a large pot and fill with enough water to cover the jars. Bring to a boil. Boil 10 minutes. Remove the jars from the water using a canning jar lifter and place upside down on a kitchen towel to cool. Prepare the cucumbers by washing in cool water being careful to remove any dirt that may cling to the skin. Remove a 1/16” slice from the blossom end of each cucumber. 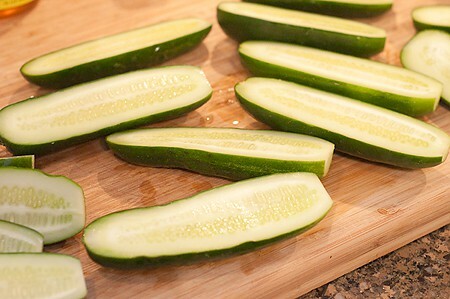 Slice the cucumbers lengthwise into halves or quarters. 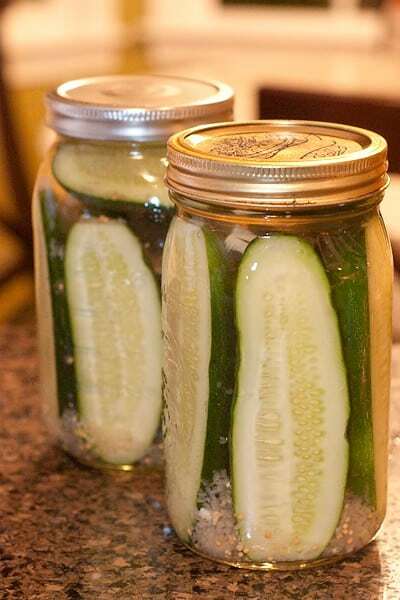 To each sterilized jar, add one head of fresh dill (if using) and pack with the cucumber halves or quarters. Pour the cooled mixture over the cucumbers in the jars. Wipe the rims with a dampened paper towel. Close the jars using two-piece canning lids. Allow the jars to sit at room temperature for three days. Shake or turn the jars occasionally to distribute the seasonings. After three days, transfer the jars to the refrigerator. May be stored unopened in the refrigerator for six months. Note: Use only unwaxed, pickling type cucumbers for this recipe. A copycat recipe for the Claussen brand of kosher dill pickles found in the refrigerator case at your local supermarket. In a large saucepan, bring the water, vinegar, onion, garlic, mustard seed, canning salt and dill seed (if using) to a rapid boil. Cook until the salt has completely dissolved. Set the mixture aside and allow to cool to room temperature. Prepare six wide-mouth quart canning jars and lids. Wash the jars, lids, and rings thoroughly in hot, soapy water. Rinse well. Keep the lids warm in barely simmering water until ready to fill the jars. To sterilize the jars, place the jars in a large pot and fill with water just to cover the jars. Bring to a boil. Boil 10 minutes. Remove the jars from the water using a canning jar lifter and place upside down on a kitchen towel to cool. 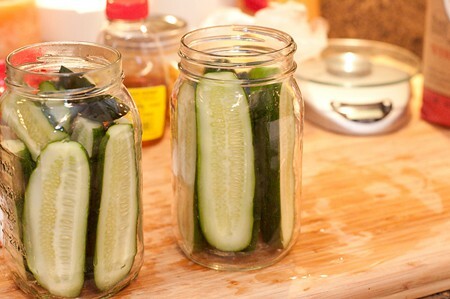 To each sterilized jar, add one head of dill (if using) and pack with the cucumber halves or quarters. Pour the cooled mixture over the cucumbers in the jars. Wipe the rims with a dampened paper towel. Seal the jars using two-piece canning lids. oh yay! I am pinning this and trying it next week..so many cucumbers right now..thank you. Hope you enjoy it, Mona! I’ve always wanted to make my own dill pickles. These ones look fabulous! I hope you’ll try them, Sues! They’re really, really easy and so good. I am concerned about not using hot brine instead of the cold brine. Isn’t this risking bacteria? Shouldn’t they be put in the fridge immediatly? Jane – I understand your concern. Refrigeration definitely slows down the growth of bacteria, but vinegar slows it even more. I felt that the amount of vinegar in the solution was sufficient to prevent problems. However, if you feel at all uncomfortable leaving the pickles out, by all means do refrigerate them immediately. Love this! Never have made these before, but there’s a first time for everything, right? YAY! Thanks! Hope you’ll give it a try, Kelly. Enjoy! I wish I liked dill pickles. Never cultivated that taste, but these look wonderful. I’ve never made kosher dills before, yours looks gorgeously perfect! Thank you for linking to my favorite quick pickle recipe of my mom’s, I need to make a batch!! You’re welcome, Brenda. Your mom’s recipe sounds delicious and I’m planning on trying it next! I make a very good dill pickle that sounds somewhat the same but we call them solar pickles because we keep them outside in the sun for 3 days. They are topped with rye bread and then the lid is put on. No onions, just , dill, garlic, salt , vinegar and water! Very very good and just can’t make enough of them! Now that’s something I’ve never heard of. Rye bread? Do you put it in the jar with the cucumbers, etc.? I’m intrigued. These remind me of my grandma’s pickles. So good. So crisp. Definitely giving these a try! You’re welcome! Your recipe sounds delicious, too. We made these yesterday and the tops never sealed. Are they supposed to or is that the reason for the refrigeration? If that’s the case, couldn’t you use old tops as long as they’re not bent? Either way, I’m sure my family will eat them before they go bad. Hi Heather – they aren’t supposed to seal. You’d have to do a boiling water process on them to create a seal. That’s why they’re called “refrigerator” pickles. The jars and lids are sterilized to prevent any chance of contamination. These looks so yummy, specially for my 8 years old daughter who loves pickles. Could I still seal them and keep them in the pantry or these are just for refrigerate them? Hi Michaelle – these are really good pickles, but the recipe is not for pantry storage, refrigerator storage only. It hasn’t been tested for canning and, based on my experience, this brine would not be acidic enough to make a safe, shelf-stable product. These are dill pickles, but what is kosher? Kathy – you’ll see both regular dill pickles and kosher dill pickles on your grocery store shelves. In addition to the usual ingredients, kosher dill pickles have garlic and black peppercorns in the pickling liquid. The garlic and peppercorns may or may not be strained out before the pickles are packed into jars. I choose to leave them in. Tried the recepie. Very easy. Let them set 3 days at room temperature, then 7 days in the fridge. I raised a quizzical eye brow at the 1/2 cup of salt. Boy oh boy! are they salty! What is the least amount of salt I can do without compromising the preservation factor? Otherwise, they were awesome! The crisp texture was amazing! I would also use fresh onion next batch. Since there is no “preservation factor” with this recipe, you can reduce the salt to any level you wish. These pickles are for refrigerator storage only. They’re not shelf stable so you don’t have to worry about preservation. Tried these a few days ago & my pickle loving family thinks they are great thanks! I did add a significant amount of minced garlic (about 4 T). I can’t imagine kosher dills without it. As long as they’re kept refrigerated, yes, they’ll be safe. They will have a different taste because of the different vinegar used, but they’ll be safe.